Our 100cm Deluxe ovens are made from refectory brick and fire cement, then insulated before being rendered in with heat proof render. Our deluxe ovens also feature a rust proof galvanised door. Customers choosing to collect will have the option to pay when there arrive to collect there item. The driver will be equipped with a tail lift and a hand pump to assist him getting the pallet to the kerbside. There is no reason why the driver would not spend a few minutes pulling the pallet with his pump truck onto your drive etc, Please note it will not be possible to go over gravel or down steps etc with the hand pump truck he is equipped with. Our courier works on a 98% accuracy rate. We can not and will not be hold responsible for any failed deliveries and can not reimburse any days taken of work etc. In the unfortunate circumstance damaged we will go out of our way to help you, for example if a door was damaged we would send you a door etc. The content of the pages of this website is for your general information and use only. It is subject to change without notice. You acknowledge that such information and materials may contain inaccuracies or errors and we expressly exclude liability for any such inaccuracies or errors to the fullest extent permitted by law. Your use of any information or materials on this website is entirely at your own risk, for which we shall not be liable. It shall be your own responsibility to ensure that any products, services or information available through this website meet your specific requirements. This website contains material which is owned by or licensed to us. This material includes, but is not limited to, the design, layout, look, appearance and graphics. All trademarks reproduced in this website, which are not the property of, or licensed to the operator, are acknowledged on the website. Unauthorized use of this website may give rise to a claim for damages and/or be a criminal offense. Your use of this website and any dispute arising out of such use of the website is subject to the laws of England, Northern Ireland, Scotland and Wales. The two main factor that will help you choose which wood fired oven to go for is the access to were the oven will be situated and how many people you intend to cook for. Below is a size guide. Has a high height cooking chamber ideal for anything from spit roasting a suckling pig to pizzas or flat breads. Deluxe Corner - The Deluxe corner is the same as the Deluxe apart from its designed to sit in corner ideal for customers with limited space. Deluxe extra - The Deluxe extra is the same as the deluxe apart from it uses a far more advanced chimney system positioned at the front of the oven rather than in the middle. The advanced chimney system uses a ram air funnel attached to the back of the door frame maximising the air flow around the dome of the oven crating a vacuum resulting in quicker heat up times and hotter temperatures. Deluxe Extra Corner - The Deluxe corner is the same as the Deluxe apart from its designed to sit in corner ideal for customers with limited space. Pro - Very similar to the deluxe extra though has a very decroative brick surround around the chimney mount. Pro stone - The pro stone is same as the pro with extra insulation and cladded in stone. Deluxe stone - This is our latest creation its our popular deluxe model that has extra insulation and has been claded in stone. Deluxe stone plus - The deluxe stone plus is the same as the deluxe stone but instead of a galvanised door it uses our premium brushed stainless steel door option. Build-in-wall - The Build-in-wall models are basically a deluxe extra that has been specially designed to be built into a wall. Italian - This is a must for customers purely wanting to concentrate on cooking Pizza and more pizza. The Italian model has a lower cooking chamber with a much more complex chimney intake system mounted at the front of the oven rather than in the center. This really helps regulate the air flow and allows intense heat to be archived quickly and easily. With the chimney being at the front it really does drag the frame all the way across the dome grilling the pizza at the same time. Maxi Italian - The Maxi Italian oven is basically the same oven as the Italian model apart from it has a special coating of a mixture of silicone and cork on the exterior of the oven, this very special coating with maximise the heat efficiency of the oven. When you take into consideration its far more fuel efficient than the Italian model and will burn less wood. Supreme - The supreme oven is basically the same oven as the Deluxe model apart from it has a special coating of a mixture of silicone and cork on the exterior of the oven, this very special coating with maximise the heat efficiency of the oven. When you take into consideration its far more fuel efficient than the deluxe model and will burn less wood. Maxi deluxe - The Maxi deluxe oven is basically the same oven as the Deluxe extra model apart from it has a special coating of a mixture of silicone and cork on the exterior of the oven, this very special coating with maximise the heat efficiency of the oven. When you take into consideration its far more fuel efficient than the deluxe extra model and will burn less wood. Sovereign - The sovereign is the next step up from the supreme or maxi deluxe, This model has a clay inner chamber resulting in Incredible Insulation and Thermal Properties - Faster heat up times - Longer Heat Retention. Superior - The superior is the next step up from the sovereign it is one our top of the range options and has everything you would expect from our flagship model. Its coated in silicon cork to retain heat, it's also clay lined making it absolutely brilliant at slow roasting as well as all usual stuff like pizzas and breads. Also, has very high quality cast iron doors. Ceramic superior - The ceramic superior is the same as the Superior however it is also tiled in very decorative mosaic tiles. Segmented - The segmented ovens come in kit form for customers struggling with access. Rustic stone - Our Premium rustic wood fired Oven is hand crafted with only the highest quality raw materials. Has its own characteristics and superior quality. The Premium rustic oven has a Aluminum Chimney inlet, a cast aluminum and toughened glass door which is regulated and completely sealed, This oven is a good choice for your home, The premium rustic oven is also super wook insulated before being claded in stone. Rustic stone pizza - Our Premium rustic wood fired Oven is hand crafted with only the highest quality raw materials Very simular to the Rustic stone apart from this is the low chamber version. The Premium rustic oven has a Aluminum Chimney inlet, a cast aluminum and toughened glass door which is regulated and completely sealed, This oven is a good choice for your home, The premium rustic oven is also super wool insulated before being cladded in stone. Rustic Brick - Our Premium rustic wood fired Oven is hand crafted with only the highest quality raw materials. The Premium rustic oven has a Aluminum Chimney inlet, a cast aluminium and toughened glass door which is regulated and completely sealed, This oven is a good choice for your home, The premium rustic oven is also super wool insulated before being cladded in brick. Pro Deluxe - Pro Deluxe ovens are made from refectory brick and fire cement, then double insulated before being rendered in with heat proof render. Our Pro-Deluxe ovens also feature a Split door with a window. Please note the heat retention on the Pro-Deluxe compared to the Deluxe or Deluxe extra its at least 100% more efferent. Also has a built in thermostat. Pro Deluxe clay ovens are made from refectory brick which is then clay lined , then double insulated before being rendered in with heat proof render. Please note the heat retention on the Pro-Deluxe compared to the Deluxe or Deluxe extra its at least 120% more efferent. Pro Deluxe stone - The Pro Deluxe stone is the same as the Pro deluxe apart from its claded in stone. Pro Deluxe ceramic - The Pro deluxe ceramic is another variation of the Pro deluxe however this one is covered in decorative ceramic tiles. Pro Deluxe prestige - The pro deluxe prestige is same as the pro deluxe stone but with a much more desirable thicker cast iron door with a full size viewing window. Pro Italian - Our Pro-Italian ovens are made from refectory brick and fire cement, then double insulated before being rendered in with heat proof render. Our Pro-Italian ovens also feature a single removable door with viewing window. Please note the heat retention on the pro-Italian comparison to the Italian or Italian extra its at least 100% more efferent. This oven has a low height cooking chamber ideal for Pizza perfection. Our Pro-Italian clay lined ovens are made from refectory brick then the inside is lined with clay, then double insulated before being rendered in with heat proof render. Please note the heat retention on the pro-Italian comparison to the Italian or Italian extra its at least 120% more efferent. Pro Maxi Deluxe - Our Pro maxi deluxe ovens are made from refectory brick and fire cement, then double insulated before being rendered in with heat proof render then a highly insulated combination of rubber, silicon and cork is applied to the outside of the oven. Our Pro-Deluxe ovens also feature a large door with a window. Please note the heat retention on the Pro maxi Deluxe compared to the Deluxe or Deluxe extra its at least 100% more efferent. This model can be used with our optional gas burner kit, when the gas burner kit is installed it can be used for wood or gas or a combination of the two. Guide to Oven weights and internal dimensions. 70cm oven 280kg 50cm internal 80cm oven 380kg 60cm internal 90cm oven 500kg 70cm internal 100cm oven 620kg 80cm internal 110cm oven 750kg 90cm internal 120cm oven 1000kg 100cm internal. Guide to moving the oven into Position. We suggest hiring a pallet truck to move the oven on the pallet into its final position. Please note a pallet truck will only move the pallet on hard standing surfaces such as concrete, slabs, tarmac etc. Any soft surfaces such as gravel or grass etc would require you to use sheets/boards of wood for you to use a path to run the pallet truck over. Guide to moving the oven on to your base. We strongly suggest for health and safety reasons you do not attempt to lift the wood fired oven by man power alone. We are not saying it is not possible we are saying we feel it would be extremely dangerous to do so. Below are some examples of what we recommend you hire to lift the oven. A engine hoist / floor crane can be. With your new pizza oven you can cook anything that your heart desires, from pizza to roast beef. There is nothing that our ovens cant handle, all with that authentic wood fired oven taste. 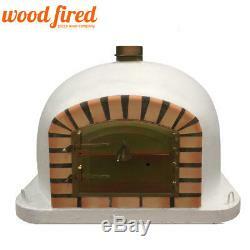 The item "Brick outdoor wood fired Pizza oven 100cm white Deluxe model" is in sale since Friday, July 22, 2016. This item is in the category "Garden & Patio\Barbecuing & Outdoor Heating\Barbecues". The seller is "woodfired-pizza-ovens" and is located in Chesterfield. This item can be shipped to United Kingdom.